Running in Edmonton, Alberta. 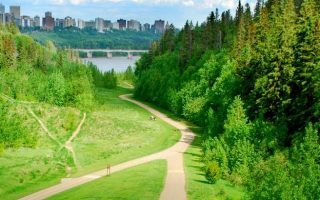 Best places to run in Edmonton. 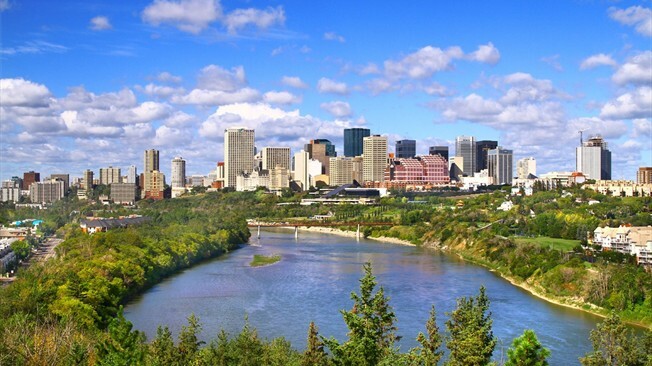 Edmonton is the capital of the province of Alberta and, with a population of over 900,000, it is one of the world’s largest northern cities. Known as the “Gateway to the North”, Edmonton is a staging point for oil sands projects in northern Alberta as well as diamond mining operations in the Northwest. The city is also nicknamed “Canada’s Festival City”, as it is a cultural and educational center hosting a year-round schedule of festivals. This is our guide to the best places to run in Edmonton. 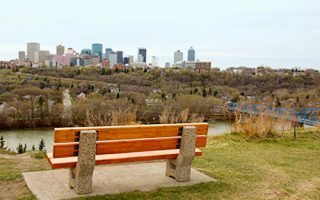 The highlight of Edmonton running is the 25 miles of paths and parks along the North Saskatchewan River, which flows through the city. This makes for a runners’ paradise, as the parks are connected by trails and roads allowing for uninterrupted routes of varying lengths. Note that sections of the River trails are cleared in winter. 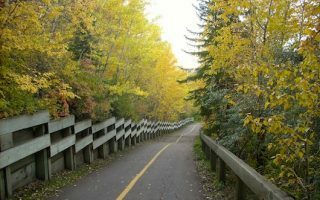 Our guide to running in Edmonton also features routes in the Kinnaird River Valley, around the University of Alberta, and some great trails in Strathcona Science Park. Edmonton is laid out in a grid system. The downtown is fairly compact. There is good public transportation, consisting of an extensive bus system and five light rail lines. Note that the airport quite a distance from downtown. The largest urban park in Canada, with 160 km of maintained trails and 20 major parks. Great running opportunities. We've mapped out routes on the north and south sides of the river, with tables for segment distances. Two of the larger parks along the River Valley network, adjoining and close to downtown. Forest Heights Park offers a 3.9 km loop, while Dawson Park has 2.3km of trails. 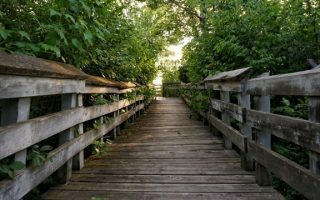 Do them standalone, combined, or with other trails, paths, & parks along the river. Good combination of downtown tour and path along the river, with two bridge crossings. The loop is 7.5 km, though it's possible to add variety along the river paths and easy to navigate grid system of downtown. An offshoot of the N. Saskatchewan River path, this trail heads down the ravine for 2 km., near the Muttart Conservatory. An easy, popular, flat run. Lots of add-on options. One of many options along the North Saskatchewan River. This 5.8 km loop incorporates paths on both sides, and several parks. Lots of good add-on options. 269 acre park, 10 km east of downtown. Popular trail running spot. Also a site for winter sports. Enjoy the many km of trails. Some good hill options. 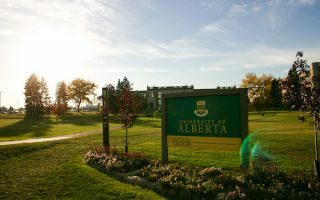 Pleasant university campus 3 km south of downtown. A loop around the perimeter is 3.2 km. Also enjoy the university's paths and streets. Several nearby, adjoining parks for a longer run. Edmonton’s climate is described as ‘humid continental’, which means warm summers and cold winters. Summers are short, warm and pleasant, with dry days, and lots of daylight given Edmonton’s northern latitude. Average July high temps are 23C (74F), with cool nights, in the 50s typically (12C). Winters are cold, with average January highs of -6C (20F) and lows of -15C (5F). On the bright side, Edmonton has a sunny climate, and only gets about 120 cm (49 inches) of snow annually. Summer lasts from late June to early September and winter lasts from November to March. The climate is fairly dry with the wettest month being July and the driest being February, March, October, and November. 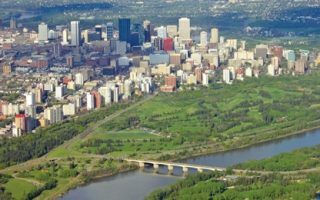 Edmonton is full of great neighborhoods and areas to stay for people of all budgets and trip types. 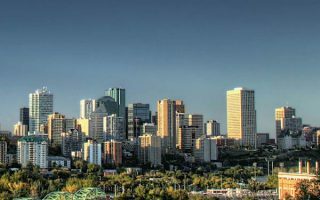 Downtown, West Edmonton, South Central, and Gateway Boulevard are all areas booming with entertainment, great restaurants, and places to explore. See our map on the Edmonton cover page for a full list of area running stores and group runs. Running Room, a major Canadian running store chain, has six stores in Edmonton. Group Runs: Wed.: 6:30 p.m. & Sun. : 8:30 a.m.
MEC Edmonton. Outdoor sports store, has running gear. There are also stores and outlet stores for Nike, adidas, and Puma.